Global warming issue has been discussed for many years. Most of the scientists consider it real and growing threat for human-being and climate. Scientists from the Intergovernmental Panel on Climate carrying out global warming research have recently predicted that average global temperatures could increase between 1.4 and 5.8 °C by the year 2100. Earth's climate is mostly influenced by the first 6 miles or so of the atmosphere which contains most of the matter making up the atmosphere. This is really a very thin layer if you think about it. Global warming is caused primarily from, putting too much carbon into the atmosphere when coal, gas, and oil are burned to generate electricity or to run our cars. These gases spread around the planet like a blanket, capturing the solar heat that would otherwise be radiated out into space. There is strong evidence linking planet’s temperature and CO2 (carbon dioxide) changes. So in order to solve global warming problem, attempts must be made to use those sources of energy that do not produce carbon dioxide. We should take steps right now to avoid underway disaster of global warming then it will be late to make changes. 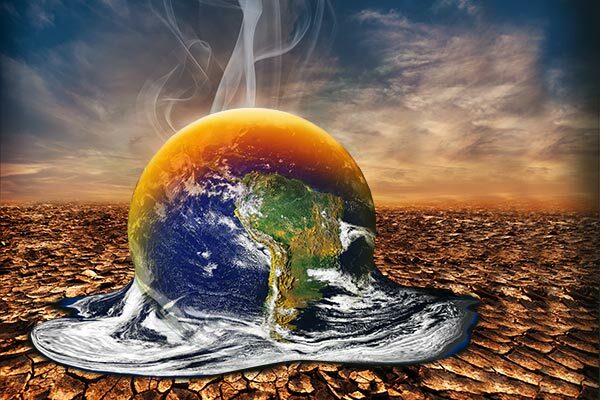 In past, we have seen various negative effects of climate change due to the global warming. Climatologists suggest some of the following measures to cut emissions or increase absorption. Start with improving energy use and conservation. Increase energy efficiency in homes, automobiles, factories and offices and cut CO2 emissions. Industrialized countries should phase out ‘Chlorofluorocarbons’, as they damage stratospheric ozone as well as absorb heat. Pass a carbon tax to discourage use of fossil fuels and encourage renewable energy sources. Reduce speed levels; raise CAFE (corporate average fleet efficiency) for new cars and trucks. This is being implemented in US, Canada, and some European countries by committing themselves to a 20-25 percent decrease in CO2 emission. Plant more trees, investments in energy-efficiency appliances, encourage mass transit and recovery of methane from landfills as these can reduce greenhouse gases. Nuclear power industry points out that their reactors are an alternative to fossil fuels and produce no CO2. Two broad reasons have been ascertained which contribute to global warming, one is human activities and the other anthropogenic (human-caused) releases of gases into the atmosphere. Statistics placed clearly show that amongst human activities maximum contribution to global warming is from burning fossil fuels whereas the contribution of carbon dioxide is released through human-caused (anthropogenic) activities. James Baker, former administrator of the US National Oceanic and Atmospheric Administration while being in India some time back, commented that the world will see a definite impact of global warming within the next 10 years. According to him, global temperature had steadily increased over the past 100 years. The increase in global warming will make society more vulnerable to climate change. “Policymakers all over the world will either have to learn to do with lesser greenhouse gases or learn to live with climate change,” he said. “What we are worried about is the enhanced Greenhouse Effect, with carbon dioxide levels in the atmosphere growing,” he further added. Baker admitted that “Developed countries have no right to tell developing countries to slow down their economic growth.” Developed countries need to find solutions and help developing countries leapfrog over polluting technologies in their quest for raising standards of living. Evidence suggests that climate change may contribute to thinning of the protective Ozone layer. Ozone (O3) high in the atmosphere absorbs ultraviolet radiation from the sun, thereby protecting living organisms below from this dangerous radiation. One of the most significant causes of ozone depletion is attributed to the presence in the atmosphere of organic chemicals called Chlorofluorocarbons (CFCs). Sources of CFC gases include aerosol spray cans, refrigerants, industrial solvents and foam insulation. There are many efforts have been made and are being continued to reduce the global warming in the world, the most well-known initiative is the Kyoto Protocol, in which nearly 200 countries have pledged to lower greenhouse gases emissions to levels borne out of 1992 United Nations Framework Convention on Climate Change (UNFCCC). In 2015 COP21, also known as the 2015 Paris Climate Conference, for the first time in over 20 years of UN negotiations, aimed to achieve a legally binding and universal agreement on climate, with the aim of keeping global warming below 2°C. We're all in a heap of trouble and the sooner we accept this FACT the better! The serious efforts should be implemented to overcome the problems of our own doing. We must try our best to solve the problems and strive to reinstate balance on our earth for sake of our future generations.